I’m back, having just suffered my third major computer failure in about three and half years. This one resulted in the replacement of the hard drive. Fortunately, no data were harmed in the course of this annoyance, though I did have to sit around for about five days twiddling my thumbs while the machine was being repaired, causing me, once again to, A) have to frantically try to catch up with everything, and, B) vow to get a lap top to use as a back-up. This time I mean it. I swear. In the meantime, all of the various hounds of the Baskervilles have arrived safely at my door and are milling around in the backyard, barking and annoying the neighbors as they demand to be heard. This time around, we’ll dispose of one of them and see another safely through to the next round as THE GRAND MOFF TARKIN and BBC GUY NUMBER ONE go at each other tooth and claw. The Grand Moff Tarkin is of course the great British actor Peter Cushing. His version (1959) was made by Hammer Films, one of the great horror movie factories. This was the first version of the HOUND filmed in color. To my chagrin (I should have looked it up) BBC Guy Number One should actually be called Granada Guy, which was the UK television film company which made this version in 1988, so, to bury my error from now on we’ll just call him by his real name, Jeremy Brett. Round 1: Holmes’s: I’m a great admirer of Peter Cushing’s body of work. He performed in a wide range of roles. He was in his share of clunkers as well as hits, but he always did the best with what he was given. His Holmes is theatrical, a bit flighty and a bit snappish, but over-all quite believable. 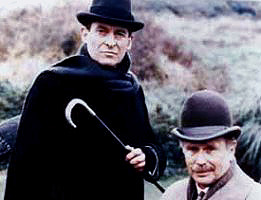 Jeremy Brett, on the other hand, is primarily known for his portrayal of Holmes. By a quick scan of the IMDB database about two-thirds of his acting life (44 television episodes between 1984 and 1994) was spent as Holmes. To many he is the archetypical Holmes. In this case, the many may be right. He lacks the lean physicality often associated with Holmes, but makes up for it in his languidly brooding manner which at times explodes into unexpected action. I like Cushing. Probably the second best Holmes I’ve seen so far. But Brett is the best. Brett: 5 ½, Cushing 4 ½. Round 3: The Holmes/Watson relationship: Again, not much to chose from. Friendship and respect is evident from both pairs. Brett 5, Cushing 5. Round 4: Supporting Cast: Cushing had his great friend and frequent acting partner, Christopher Lee, as Sir Henry. Brett had (surprisingly) an American actor named Kristoffer Tabori (who is still working today, mainly as a voice actor and television director). Lee, of course, is a tall, handsome man with incredible physical presence both on the screen and in person (I had the great pleasure to once meet him at a con and chat with him for a few minutes; his presence is overwhelming.). Surprisingly, he chose to suppress these natural gifts and portray Henry Baskerville as a rather feeble scaredy-cat (Petrified of a tarantula? Really?) whereas Tabori, lacking Lee’s physical presence, made Sir Henry the nicest guy imaginable and by far the most likeable Sir Henry we’ve come across so far. Other roles are fairly equitable, but for the Stapleton’s. Ewen Solon (Cushing) plays the character as written: a sinister, very blue collar sort who lacks the fancy airs of the previous Stapleton’s we’ve seen. James Faulkner (Brett) is the usual aristocrat-lite Stapleton, but with a more sinister streak which, unfortunately, is expressed almost entirely off stage. Marla Landy (Cushing) plays Stapleton’s DAUGHTER (in this version) Cecile, as if she’d been raised by wolves. Impolite wolves. Fiona Gillies (Brett; in her debut role) is really a bit of a cipher. Brett 5 ½ to Cushing 4 ½ . Round 5: Setting: Both films are shot in location in England, but, really, would it kill these guys for once to ACTUALLY FILM THE MOVIE IN DARTMOOR? I mean, Jeez, it’s not that big an island and I’m sure they have hotels in Devon where you could stay. 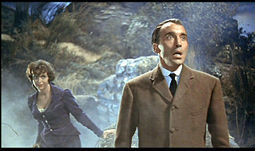 The Cushing version was shot in Surrey, which is close to Devon; the Brett in Yorkshire, which isn’t. Both locales were decent looking. The Cushing version wisely abandoned the rather fake neolithic stone huts and henge-like remains for a more classical ruined abbey look. Except for a few establishing shots, the Brett version abandoned the concept of ruins entirely. Also, the Brett Baskerville Hall was a gloomy old pile that, while probably accurate in appearence, added little to the story. The Cushing version was probably a set (on the inside, anyway) but it was more sprightly and at least didn’t envelope the actors in almost constant gloom. Cushing 5 ½, Brett 4 ½. Round 6: Screenplay: Here’s the nub. The Brett version is by far the most accurate adaptation of the novel we’ve seen so far. It goes so far as to introduce the mysterious “L. L.” character (no, not Lois Lane, Lana Lang, or even Lex Luthor), the first film version we’ve seen to do so. The Cushing version wanders considerable afield, introducing a dotty old clergyman, the afore-mentioned tarantula attack, and totally changing the Stapleton’s relationship. Some of this was not convincing (Okay, I’ll give them the tarantula, but the Sir Henry/Cecile relationship was totally unbelievable. Sir Henry must have spent a long, lonely time up in those Canadian woods to immediately start chasing Cecile, who, from the get-go was quite apparently batshit crazy.). Still, they did bring everyone together for a dramatically satisfying climax (details withheld), which is what the Brett version lacked. Oh, somebody does get sucked down into the Great Grimpen Mire, but in kind of an off-handed, hey, I’m wandering in the dark sort of way, and other characters are just left hanging by an overly-abrupt ending. All in all, though, the Brett version screenplay is a tad better-considered. Brett 5 ½, Cushing 4 ½. Round 7: The Hound: And really, would it kill these guys to also get a decent hound to play the Hound? After all, he’s the title character. The Cushing version gives us a dog in a Batman mask, the Brett a dog whose legs are painted with a rather embarrassing green phosphorescent paint. So far, I must say, the lack of a credible Hound was been a major disappointment in all versions I’ve seen. Brett 5, Cushing 5. Both are quite credible adaptations, and it’s tough to chose between them, but choose we must. The Brett version takes it by a nose, 36 to 34. Let’s close with another view of Marla Landi (Cecile Stapleton) the scariest thing in the Cushing version. Scarier than the Hound. Scarier than the tarantula. Next Round: Max Headroom vs. Dr. Who. Expect the fur to fly on this one!